Cottages | Bavarian Cottages Ltd.
Click on the Cottage of your choice to see more information or ask us ! 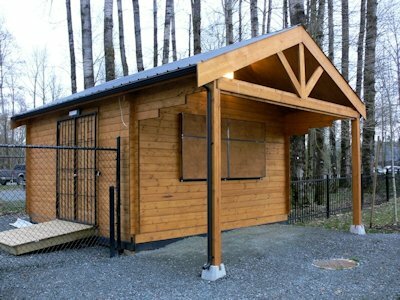 -This is one of our very popular models in the micro sized cabins. It features a small loft sleeping area to save the entire main floor for a small kitchen, sitting area with pull out couch, table and chairs. Starts at $8,195.00 to lock up including the floor system, roof system and deck!!!! 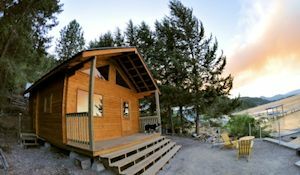 -This is one of our most UNIQUE cabins ever made. With the space limitations of this site and the need to house a person full time, this is an example of what can be done in a very small space. Amazingly it has a bathroom with toilet shower in the far back, a closet on the back left behind the shower which is accessible from the main room and of course the main front room area. In the main room, it has a twin bed with flat screen tv mounted on the back bathroom wall, it has a kitchen unit with sink, hotplate stove and sink plus a fridge and YES there's more, there is also a large storage chest for clothes by the door. Of course you are wondering how large is this MICRO CABIN ? In fact it's still under the 10 sq.meter size. Given that it's in Whistler BC Canada, and was built for the Winter Games held there, it needed to be warm so it has R40 insulation in the ceiling and R28 in the floor. This Micro Cottage shows what can be done in a small space ! 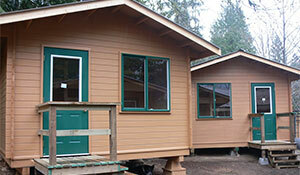 - These were built and color matched at a childrens camp to provide staff accomodations. They featuretwo bunkbeds built into the rear wall in this application to help increase their capacity. The bunkbeds are not included as they may or may not fit everyones needs but this is just another look in the micro cabin sized plan area we have. These also are under 10.sq.meters or 107.6sq.ft to allow them to be built without permit under the local rules. This model was custom made to be wide and shallow due to space restrictions of the site. The width but shallow depth necessitated that the loft be mounted on one size of the building rather than the back. 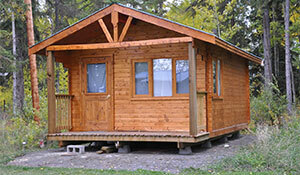 The cabin as seen has a double bed in the loft and one double pullout on the main floor. - This model has been one of our most requested models in it's size class for all sorts of uses. This one was used a personal backyard office and from this model spawned many different variants to suit the many needs of our clients. From a spare bedroom, to an office to a concession stands and a pool side cabin, this is by far one of our most popular models. 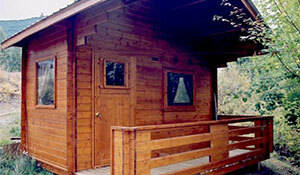 They also make an excellent place to rent out as small lakeside overnight trail cabins. 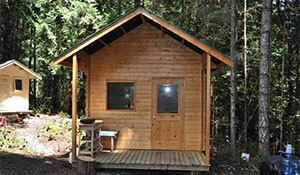 Below are our Small Cabins - Footprint 108sq.ft to 256sq.ft. -This is our most requested model over the years as it's affordable and expandable, as most of our cabin are. 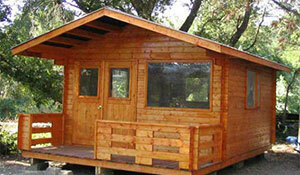 -The madrona also has a Stage III loft which is perfect to accommodate extra guests. 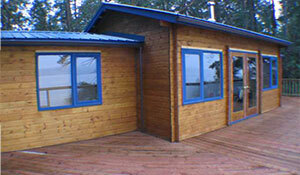 - Another incredibly popular cabin is this Bar 5C cabin found in Bragg Creek Alberta. 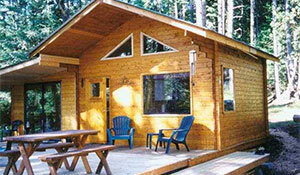 The cabin is used as a weekend getaway for the family and is very similar to the Madrona in size. Clearly the look is different from the Madrona as it does not have the addition or the triangular windows and it is a bit smaller. We really like what the client has done with the cabin as seen, adding shutters and the lanterns amoungst other things but also the color is a departure from most of our cabins and it's a really nice change of pace, not that we don't love the color most of our cabins are, we chose it of course to bring out the wood tone and grain, but the beauty is in the diversity ! -This unit was designed with a workshop in mind with large double doors and a lot of windows for maximum natural light. It is also well suited to anyone needing to park larger items inside, such as a lawn tractor or quad as the wide doors make that a snap to do. -Window height allows for a workbench underneath but as usual, all window sizes and locations can be changed to suit your needs. 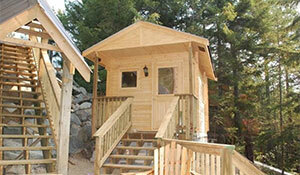 - This was built as a bunkie style cabin for additional living/sleeping space for the kids and friends at Green Lake, BC. Its 14ft wide and 22ft long including the 4ft deep deck. It's essentially one big room for beds and a games table. 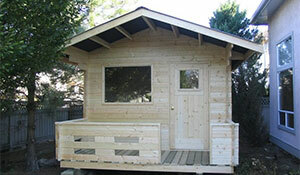 - This Cabin is loosely based on our very popular Madrona but these clients needed a lot more space. There are a number of neat features to this cabin. The first one is obviously the size of it, it has a lot of room for a family of 4. 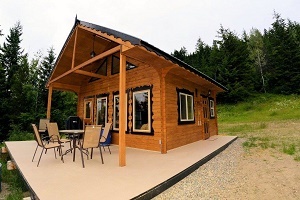 With a bedroom downstairs for the parents and the large sleeping loft for kids ( 6 could easily sleep up there ) this is an ideal cabin for the budget minded family. It's very affordable, easy to build, and still does it all. As you can see, we added an external door to the bathroom. This allows people to use the bathroom without trudging dirt all through the house . This little feature really does add a lot of practicality to the cabin. 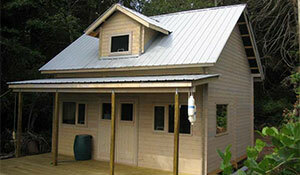 This cabin is 18ft wide x 22ft long including the 4ft deep deck. 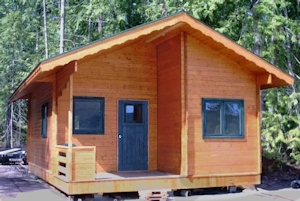 - This cabin was built as one of the first cabins in a new resort on Shuswap lake many years ago and has been lived in by dozens if not hundreds of people since then. It has a unique feature with the tucked in covered partial deck that is beside the kitchen which adjoins it on the right. It has a bedroom at the back, a full bathroom also at the back and a big sleeping loft for people to stay in if needed. 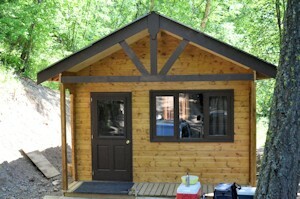 Overall this cabin is 18ft wide and 26ft long. 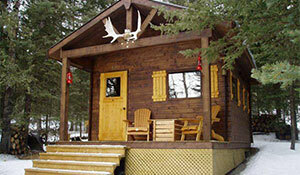 This is a fantastic new cabin that was just built last summer. More pictures to come soon but we had to leave a space for it. It's 20ft x 20ft plus deck. It has a bedroom downstairs, an oversized loft and a full bathroom as well. The loft has two single beds ( which could be doubles ) and room to spare. Tom really went out of his way to add his own personal flair to the cabin with the black accents and other embellishments. It has an amazing wrap around deck with the second bathroom entrance off of the side, again to ease access to it without trudging dirt through the cabin. This amazing cabin is perched high in the hills and has a commanding view of the valley and river below. This Cabin is located in one of the most prestine places on earth. Surrounded by jagged snow and ice capped mountains on one side and lush alpine meadows on the other, this stunning landscape is where this gem sits. It is a lofted varian of the Fox's Den seen above. 14ft wide and 20ft long it's really spacious because the stage 2 loft allows all the beds to be up top and leaves the entire downstairs to be used for whatever you chose. -This little charmer has a small footprint of just (20’ x 18’) not including the deck, that affords tons of space due to its enormous loft. While it doesn't look that big, the upstairs could easily handle 4 queen sized beds and have room to spare, it's very deceiving how much space there is inside by simply viewing the ouside. This is an extremely good value in our cabin line due to the loft space being so generous in size. 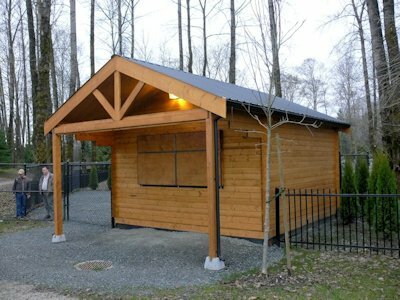 We also do CUSTOM commercial jobs as well such as this Concession/Rental building built on a custom steel frame. The custom steel gates and frame were also built by Bavarian Cottages. We have all the equipment to make nearly any brackets, frames, or specialty items in house for all of our projects.